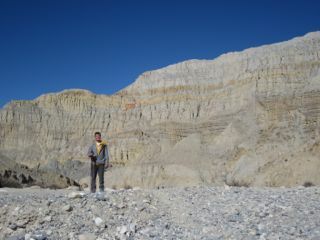 Think the Grand Canyon is cool? 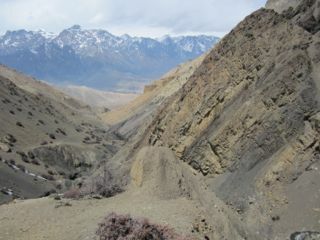 There's a hidden a region right smack in the middle of the Himalayas directly south of Tibet that consists of a huge system of canyons that make the Grand Canyon look like a children's playground! 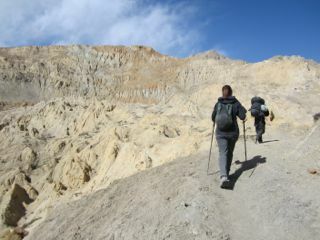 We had crossed Thorong pass and were ready to start the second part of our 33-day trek. 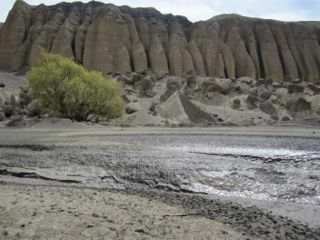 Upper Mustang is the Grand Canyon on steroids, a place where Tibetan traditions still rule every aspect of life and subsistence farming is the main economic activity. 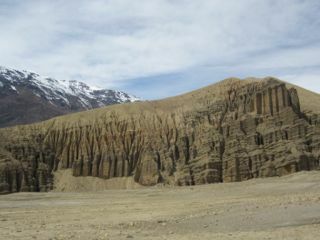 Today, Upper Mustang is "little Tibet" and, according to many, is actually more Tibetan than Tibet itself. 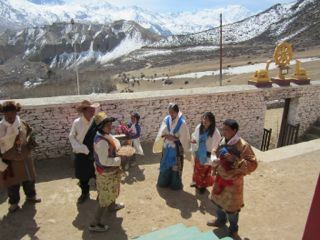 For the most part, the religious and cultural traditions in Upper Mustang are as strong as they were thousands of years ago. 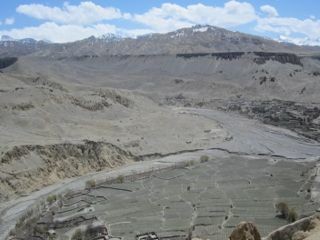 Until very recently, Upper Mustang was actually the independent himalayan Kingdom of Lo and was only officially integrated into Nepal a few decades ago. 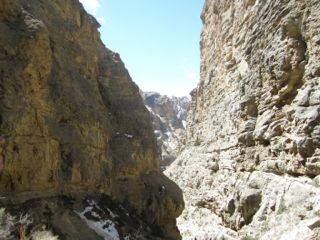 The only way to access the region is by hiking for days along hard mountain trails. 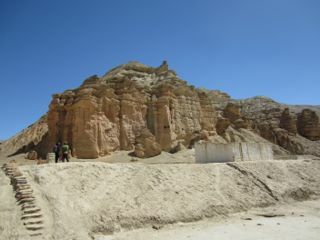 Given the historical and cultural uniqueness of the region, we made visiting Upper Mustang an absolute priority, especially because new roads will be built very soon and the region will be changed forever. 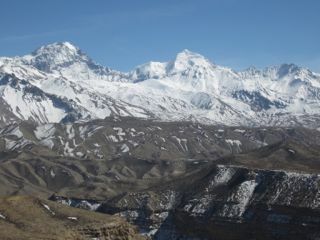 Visitors must pay the Nepalese government a hefty minimum $500 USD fee and hire a guide in order to enter this protected region. 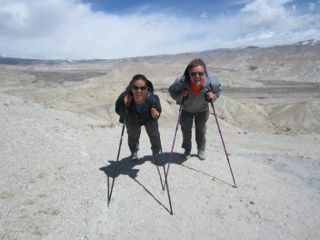 We arranged all of this prior to starting our trek and on day 13 of our 33 day hike, we ventured into Upper Mustang. 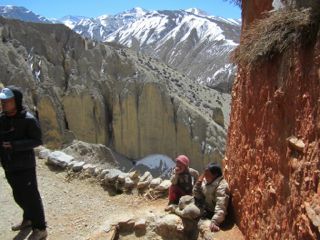 Our guide, Karma, is an Upper Mustangi from the small village of Samar and he guided us on an unbelievable 12 day hike throughout the ancient kingdom. 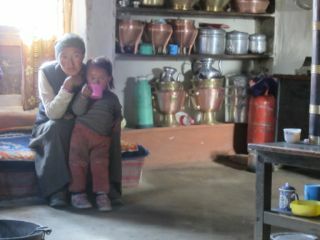 We often stayed in people's homes and we even attended a wedding in Karma's village! 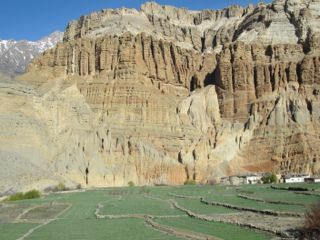 What struck us the most about Upper Mustang is how untouched it all felt. 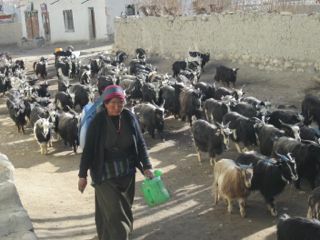 Goatherds still herd goats the way their ancestors did thousands of years ago, dry wood is burned in mud ovens to cook food and boil water and running water and electricity are both luxuries that are hard to find. 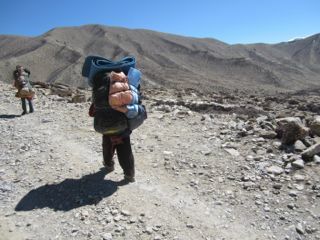 Karma said that there are even many peaks and paths that have never even been summited or explored! 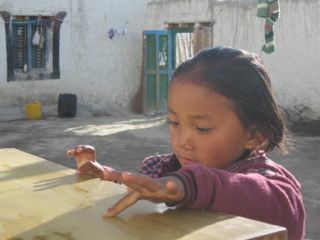 The people of Upper Mustang are extremely devoted to their religion and traditions - we saw monks everywhere and butter and fresh pine offerings were made on a daily basis. Cows are sacred so they are not eaten, instead their milk is used for religious ceremonies and to make butter. 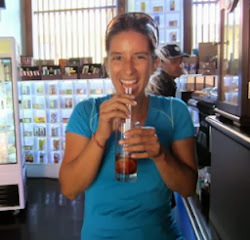 Sometimes, if you're lucky, you can even get fresh home-made yogurt (we were lucky enough to find it twice!). 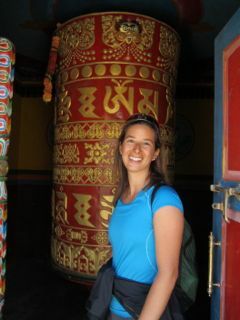 Temples abound: we even hiked two hours up to temples that were carved directly out of rocky cliffs! 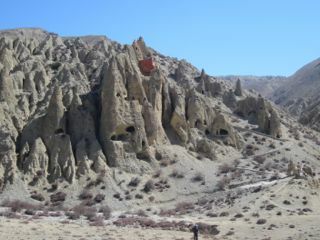 The region is famous for it's ancient cave dwellings. Constructed more than two thousand five hundred years ago, these complexes are carved into vertical cliffs and are often five stories tall! 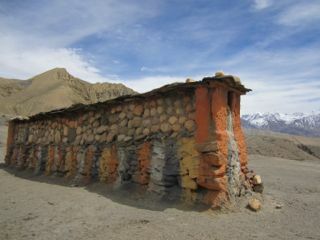 They were built to be highly defensible and the local villages have used them for centuries since to avoid the Tibetan raiders that would occasionally invade during the Middle Ages. 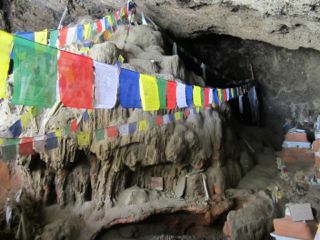 We actually got to clamber around in one of the caves that was only six kilometers from the Tibetan border. 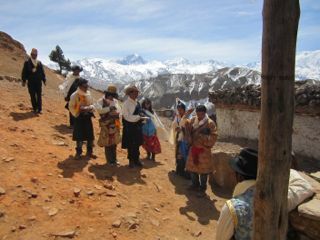 Upper Mustangis are also some of the hardest-working people we have ever met. In order to go anywhere or even get anything, you gotta walk. 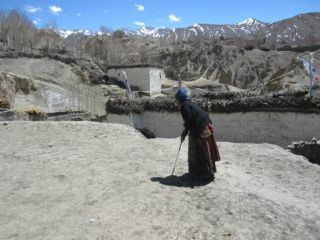 If you're 80 years-old and feel sick, tough luck: chances are you gotta walk 8 hours to the nearest hospital (we actually walked into a very old woman who had just crossed a 4000 meter pass by herself to go to a hospital and she was asking us if we had any medicine for her knees because they were hurting; unfortunately we did not). 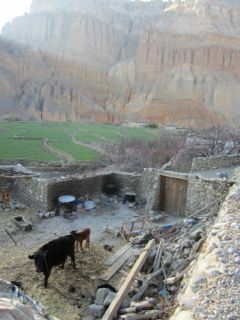 In order to eat, you gotta grow your own food or pay a hefty fee to have goods brought up on mules. If you want to cook, you better go stock up on wood because that's the only source of heat you'll find. 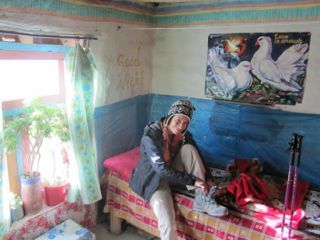 And, to survive the incredibly harsh winters, you gotta dry up all your veggies because nothing will grow during winter. 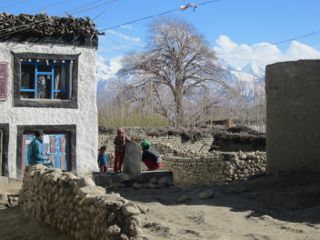 As a matter of fact, winters are so harsh that most residents, students and monks opt to leave Upper Mustang for 'holidays' in the warmer Pokhara or Kathmandu cities. 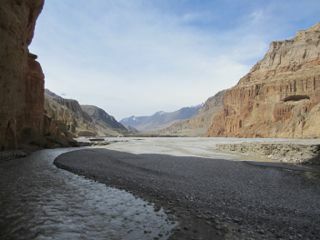 When we reached the capital of Upper Mustang, Lo Manthang, the acquifers were frozen so there was no running water. Keep in mind that this was already April! As the region continues to develop, it won't remain untouched for much longer. 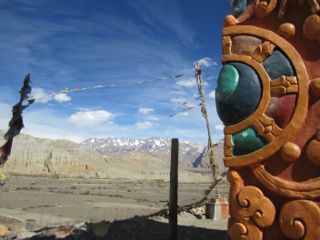 We feel immensely lucky that we had the opportunity to do a little time travel and fully imerse ourselves in this wonderfully unique culture. 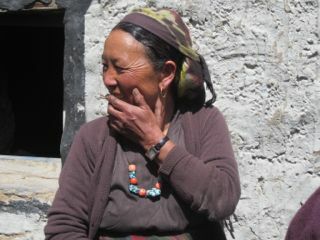 Our guide, Karma Mustangi, was exceptional. 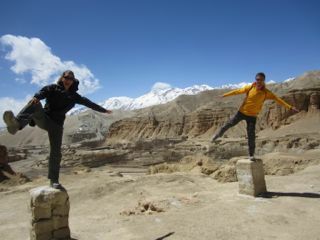 Contact him at karmakurt@hotmail.com to arrange your own adventure in Upper Mustang. 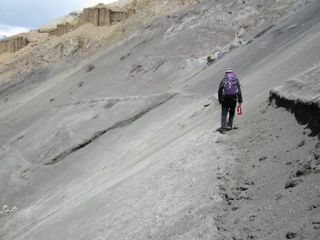 Eastern Upper Mustang - we were first foreign visitors in 2013! The air was so cool, crisp and clean! 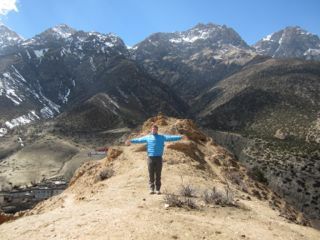 At a very, very windy pass on our way to Lo Manthang, Upper Mustang's capital "city"
The orange 'box' is a the monastery built on the cliff! 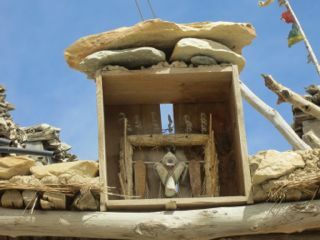 We would often walk into goat herders; this is a 1-hour old baby goat!